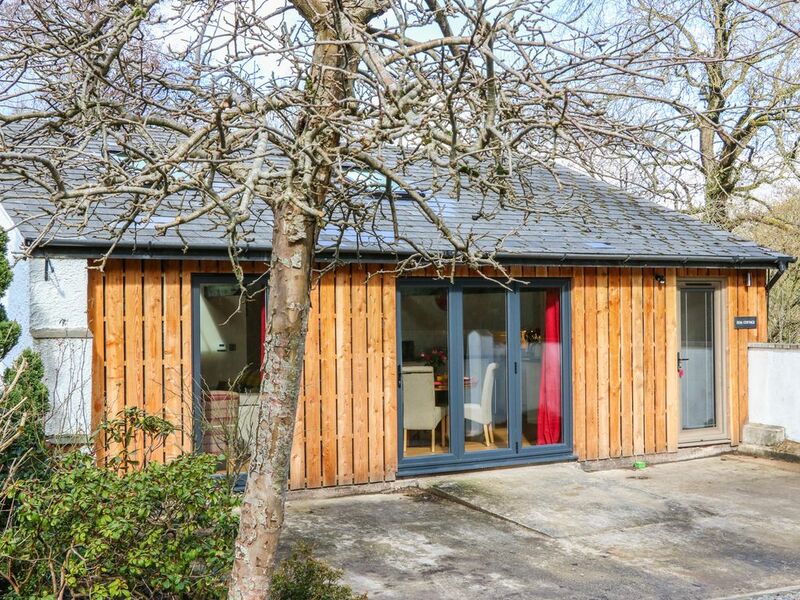 A first floor apartment set near the village of Zeal Monachorum, near Copplestone, in Devon that can sleep four people in two bedrooms. Zeal Cottage is a first floor apartment located near the Devonshire villages of Zeal Monachorum and Copplestone. It has two bedrooms including a king size and a twin, both have en-suite shower rooms, the apartment can sleep four people. Also inside there is an open plan living area with a kitchen, a dining area and a sitting area. To the outside there is off road parking for two cars, a shared utility, a front decking with furniture and a rear patio with furniture. Zeal Cottage is a sumptuous property in an excellent countryside location. Amenities: Eco underfloor heating. Electric oven and hob, microwave, fridge/freezer, washing machine, tumble dryer, dishwasher, Smart TV, sound system, WIFI. Fuel and power inc. in rent. Bed linen and towels inc. in rent. Off road parking for 2 cars. Lockable storage. Cot and highchair available on request. Shared front decking with furniture, enclosed rear patio with furniture. Sorry, no pets and no smoking. Shop and pub 3 miles. Note: This property is in close proximity to a river, care must be taken, and children supervised at all times outside. Town: The mid Devon village of Copplestone is situated in lovely green countryside, four miles from the town of Crediton and a twenty minute drive from the cathedral city of Exeter. Copplestone has a shop and pub, as well as the Copplestone Cross, which is said to mark the centre of Devon, with many believing it dates back to the 10th century. There's also a station at Copplestone, from where you can catch a train on the renowned Tarka Line. All first floor. Two bedrooms: 1 x king size double with en-suite shower, basin and WC, 1 x twin with en-suite shower, basin and WC. Open plan living area with a kitchen, dining area and a sitting area. External shared utility. Eco underfloor heating. Electric oven and hob, microwave, fridge/freezer, washing machine, tumble dryer, dishwasher, Smart TV, sound system, WIFI. Fuel and power inc. in rent. Bed linen and towels inc. in rent. Off road parking for 2 cars. Lockable storage. Cot and highchair available on request. Shared front decking with furniture, enclosed rear patio with furniture. Sorry, no pets and no smoking. Shop and pub 3 miles. Note: This property is in close proximity to a river, care must be taken, and children supervised at all times outside.